If anybody ever reads this, please let me know. The real reason I go to all this work on the blog, and believe me it’s way too much work for a one-person business, is to create backlinks to my website and therefore a good position on google. I haven’t been doing it lately, wonder why, it’s so much fun. Thank goodness for all my nice customers who send me photos of their bathrooms so I have some content. This one ordered a pair of the Butterflies, Fruit & Flowers design painted sinks, but in two different sizes, one slightly smaller. She was redoing the bathroom in an older home and that’s the way the bathroom was. These sinks are available on my website, decoratedbathroom.com where you will find a great selection of decorated and painted sinks, all made by hand, by me, Lynne Sands in beautiful(?) Henderson, Nevada. Before I get to the actual bathroom, let’s start with the sink. 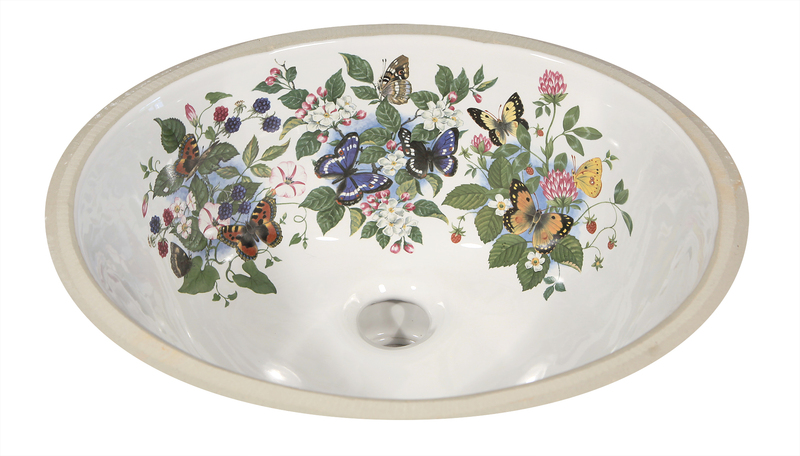 Colorful butterflies, fruit and blossoms design decorated bathroom sink. Painted on a white under mount vanity sink. Made in the USA by hand by decoratedbathroom.com. The sink features multiple butterflies in multiple colors… yellow, orange, blue and shades of brown. They are resting on fruit blossoms, blackberries, strawberries and not sure what those ones are in the middle, apple blossoms, cherry? Anyways, whatever they are they look beautiful and really set off the butterflies. 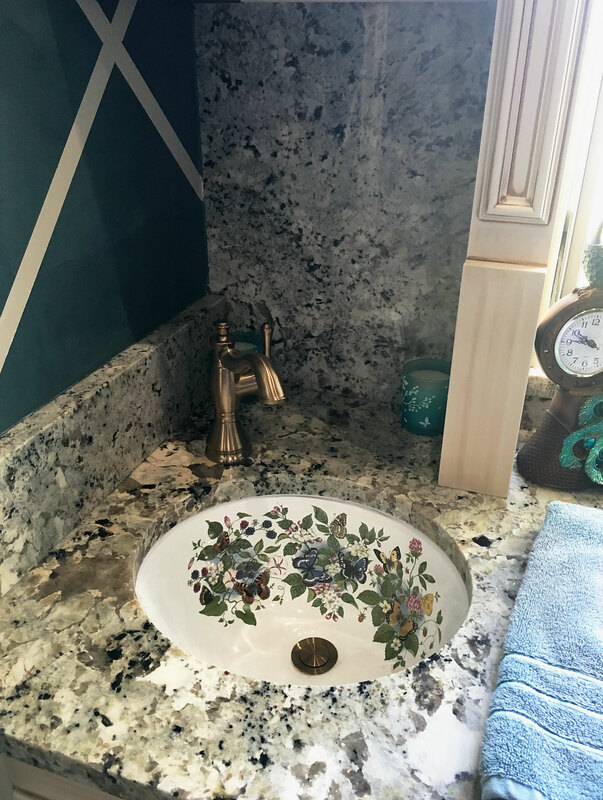 This is another sink that a customer inspired me to make a few years ago, I usually did them on a vessel sink but she wanted an undermount and it looked so good I put it on the website and I’ve made several since. 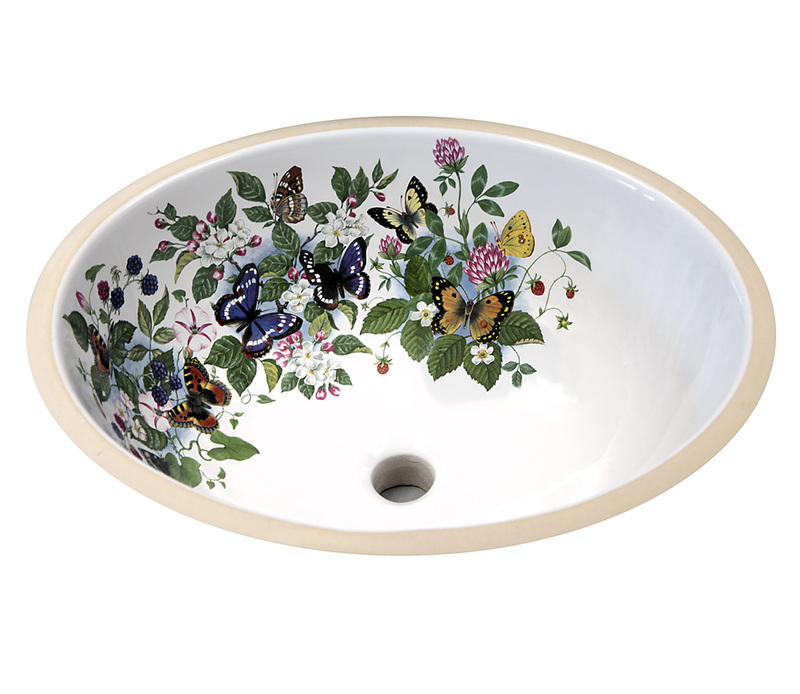 Butterflies and Flowers design painted bathroom sink. The first thing I notice (besides the beautiful design on the sinks) is the walls. Not sure if that’s wallpaper or hand-painted on there but it looks really good. Draws you into the bathroom space, for sure. I like the granite, it’s way different than the sink but works well with it. Nice tub in the mirror reflection and anybody notice the hummingbird on the wall? 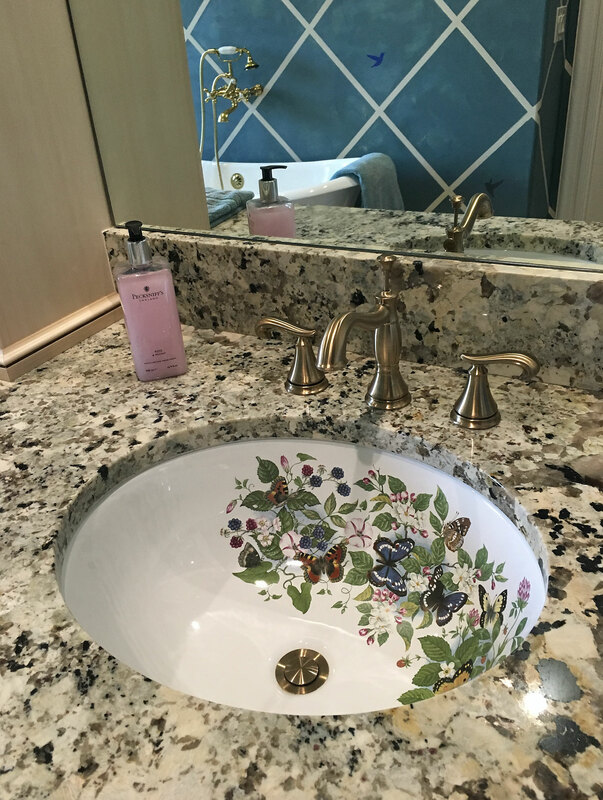 Beautiful bathroom with marble counter featuring the Butterflies & Flowers painted sink by decorated bathroom. Because one area of the bathroom was smaller, we put the design on this small sink, about 14 x 12″. I don’t know why, but small sinks always look fantastic with the decoration on them, cute but in a good way. We also positioned the motifs centered on the back of the basin because of the small size. It looks so cute tucked into the corner by the window in the bathroom. This is the actual sink. It’s a standard oval under mount, 14″ wide x 12″ front to back. To see a really good close-up of the design, check out this previous post. If you like Butterflies & Flowers, there are several designs on our website that include butterflies. I have one of the Butterflies & Flowers Vessels left, and I often add a butterfly or two to the Scented Garden and Victorian Garden design. Please check out the complete collection of decorated and painted bathroom sinks on our website, decoratedbathroom.com. Thanks for reading. Lynne.